As I began reading Willson’s novel, I realized almost instantly how unique this YA novel truly is. I’ve read a number of fantasy books, but there was something about Willson’s that made it so much more extraordinary. There are certain elements that are commonly found in most fantasy novels, yet Willson still found a way to make it an original. The type of magic within the novel is one example, for I found it rather exotic and a foreign to Western culture…this was certainly a breath of fresh air. Time and time again, I start reading novels and grow utterly disappointed that there’s this “cookie-cutter” thinking of GOOD and EVIL…Willson’s novel DID NOT disappoint in this regard. The “good” characters commit some heinous crimes, and the “bad” characters experience moments of enlightenment and clarity on a more righteous path. There are some characters that are very clearly good OR evil, but that’s to be expected and it didn’t take away from the overall feel of the novel. 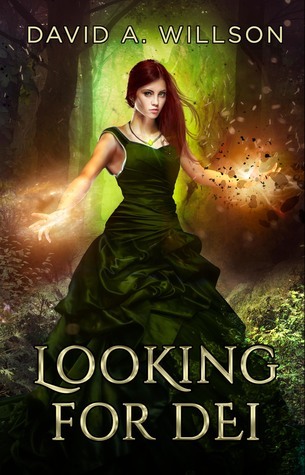 In Looking for Dei, there’s NO gradual progression when learning about the characters; readers are basically given the entire background of the character in the first encounter, leaving no room for mystery and hinders on character development. This also overloaded me with information, which does NOT appeal to me, especially in a series based novel. The story felt very similar – rather than small peak into the plot, we’re given PILE of information, leaving me a little confused and disoriented. Even though Willson gives us a TON of information very early in the novel, there’s still these “how did that happen” moments…the moments where you have no idea how the story jumped from A to B or character A was able to do that “thing” they weren’t able to before. Unique and authentic, Willson’s Looking for Dei is a YA novel that introduces a new way of exploring the realm of fantasy and magic. Though the character development and story progression fell short, I feel as though there’s a lot of potential to this new series. If you’re a character and language driven reader, this may not be your cup of tea. HOWEVER, if you’re a story oriented reader and lover of the fantasy genre looking to try a new series, this may be for you.